My first game, SCP-The Escape, fully coded in Java. Based on the SCP Foundation which can be found here. Thanks to: Ulixava, FoxK307, Rumikarimu, Ca$h, Ajoura, VenomJack, MrCompost and DarkKnight. that are 2D, and that also allow you to PLAY as some of the SCPs! This game has multiple gamemodes. Right now there only is Class-D and SCP-058. 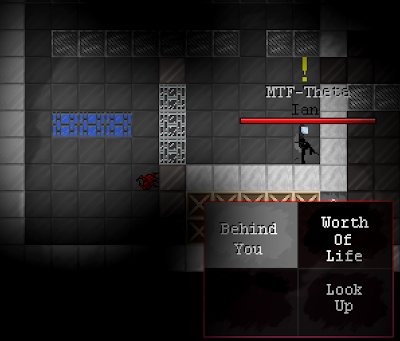 In Class-D mode you play as a defenseless lil' Class-D guy where you need to survive each obstacle in your path. You may encounter any SCPs... This gamemode doesn't have an ending yet, but I'm planning on making one, and keep in mind, THIS GAME IS STILL IN ALPHA. It has a lot of bugs. Jumping in SCP-058 mode may turn you sideways for some reason, simply re-jump to fix it. - Redone the Audio system of the game to make the game more lightweight. - Made the main menu theme play on startup instead of after the intro animation. Created by PhuckYuToo. Published under a CC license. Hey! I'm incredibly interested in this... Unfortunately the .exe is not working on my Win 7 setup... Is there anything that I need to do beside double click the .exe? I'd download the .jar if I could... but my download keeps cutting out, and being filedropper I can't add the download to my download manager, which would allow me to resume it if my connection (inevitably) drops out [crappy wireless connection is my only option]. Is there somewhere else I could download the .jar? A google search turned up... not much besides this site (for the .jar that is), for the .exe there's a few other sites out there apparently. But I can't get that to work. So yeah... cheers mate ! I downloaded all of the versions and none of them is working and all I do is double click and it doesn't load I tried game jolt I tried .jar, .exe, and your new .jar they all do the same thing if you can please give me advice Phuck Yu. Oh yah I played v0.2 and that worked well and tried running the file as administrator. What about you run it through cmd? if it works, you're good. If not, it should give an error in the console. Print that error out on the site and I'll see what's wrong. Do I have to download cmd? Could You Make A Tutorial Video LOVE YOUR CHANNEL Hope You Make More Vids Soon. Will make vids probably soon, but right now I'm simply too busy with game programming. Could not find the main class: net.PhuckYuToo.TheEscape.Component. then all i can do is click the 'ok' button. CMD doesn't work for me, either. and on top of EVERYTHING ELSE, I couldn't download it on my computer thanks to my WONDERFUL antivirus program, saying "sorry, fewer than 50 people WHO HAVE NORTON (the antivirus) have downloaded this, so we're gonna remove it from your computer entirely... WITHOUT ASKING! for more information, please go to this site that is in 100% JAPANESE! Sir, I have an issue. When the EXE runs, my antivirus (Norton) deletes it. The jar file doesn't do anything when opened. Please help! Guys, try redownloading now. The game's updated and it's more lightweight/optimized now. Still Dosen't work, Keep getting a Could not find the main class: net.PhuckYuToo.TheEscape.Main. Program will exit. Hello there, My stupid internetwarrior name is PhuckYuToo as you can probably read. I'm a game developer, occassional youtube video uploader and overall music enthusiast. It's good you have a working internet connection at the moment, otherwise you wouldn't be able to read this. Welcome to the website! Stay tuned for upcoming projects! Made by PhuckYuToo.. Awesome Inc. theme. Powered by Blogger.